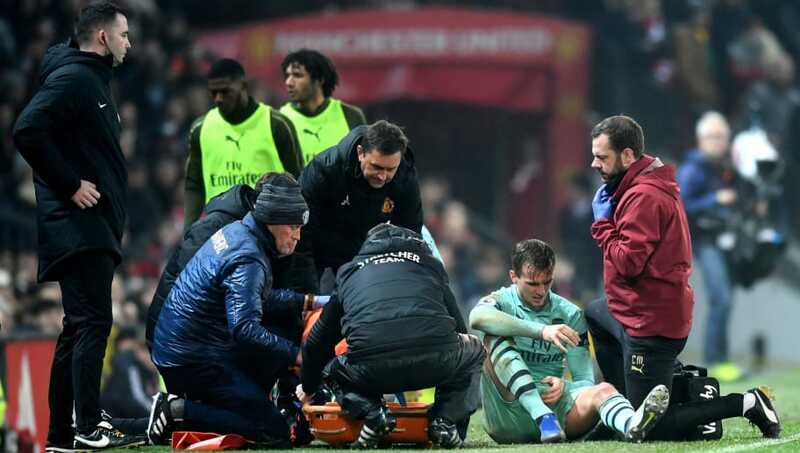 ​​Arsenal manager Unai Emery has revealed that he fears the worst after Rob Holding suffered a knee injury and had to be stretchered off during the 2-2 draw against ​Manchester United at Old Trafford last night. Holding was an early casualty in the first half, with Emery having to bring on the experienced right-back Stephan Lichtsteiner in his place in the back three. It looks likely that Holding will be out for a long time. "[It was] the worst news for us," he told a news conference, according to ​Goal. "Rob Holding, we are going to wait for the doctors, but it is a big injury. It's his knee. "After these two injuries, every player went out with good commitment and good mentality to keep our performance on the game. "We couldn't control for the full 90 minutes. This draw is not the best, but not the worst. I said to the players now we need to finish this week well [against Huddersfield Town]." Arsenal have very few options for the centre of defence, with Laurent Koscielny still working his way back to full fitness. The Frenchman has played in two Under-23 games and seems to have done well so far. "Laurent is very close to playing," Emery said. "He played two matches for the Under-23s, the last on Tuesday. We are thinking he will start with us soon. "I don't know if Saturday is a possibility. We are thinking the Europa League against Qarabag is a possibility [next Thursday]." It remains to be seen what Emery does with his defence, especially considering that they have a congested fixture list over the next month.